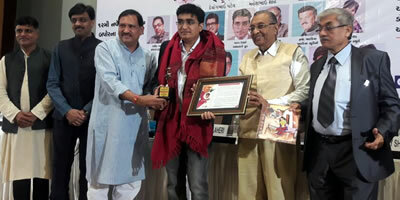 Parag Desai felicitated with the NRI Seturatna Award for his exemplary service and engagement with the NRI community by Global Gujarati Federation. Parag Desai was awarded with the NRI Seturatna Award at a ceremony organised by Global Gujarati Federation at Ahmedabad Management Association on Sunday, 12 November 2017. Speaking about the task of increasing brand recognition of Wagh Bakri Tea Group he said "I travel extensively and with the blessings of the elder generation and the support provided the team of professionals working at Wagh Bakri Tea Group we have been successfully able to increase brand awareness globally. The NRI community has played a key role in taking their favourite tea brand ‘Wagh Bakri Tea’ to the international market. I dedicate this award to millions of Gujaratis who are the true brand ambassadors of Wagh Bakri Tea". Enumerating the major achievements and research undertaken by Wagh Bakri Tea Group, Mr Desai said that “It is noteworthy that Wagh Bakri Tea is now available on the Facebook Campus and on Singapore Airlines. We constantly innovate in our state of the art NABL certified laboratory and we would soon be launching a product with medicinal benefits”.